So this is a one time only pairing of two musical greats. George Benson and Jill Scott recorded the Gershwin classic Summertime for a benefit album and a benefit concert. Benson first recorded Summertime on his 1966 album It's Uptown and then he recorded it with Kenny G on the 1999 album Classics in the Key of Kenny G. The idea to bring Benson together with Jill Scott was part of a concert series called Broadway's Best. Composer Frank Wildhorn thought it would be interesting to see what pop singers could do with Broadway classics. The show was taped for Bravo at the Hammerstein Ballroom in New York City and it aired on Bravo in Mar. 2002. It is not available on DVD. It was a benefit for a children's hospital charity. Those appearing on the TV show were Darius Rucker, George Benson and Jill Scott and then Benson solo, Bacon Brothers, Joan Osborne, Shawn Colvin, Jamie-Lynn Sigler and Loudon Wainwright III. 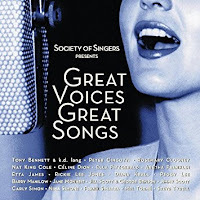 That brings me to the CD which was released in 2004 to benefit Society of Singers (SOS). They were founded in 1984 by Henry Mancini's widow Ginny Mancini to offer medical expense support to singers who of course don't have a union. Apparently Ella Fitzgerald was an early supporter of SOS. Their funding comes from private donations mostly from famous singers. This CD was released in 2004 by Shout Factory and proceeds went to SOS. Except for the Benson and Scott recording of Summertime, there are no original recordings on this CD. The oldest recording is Frank Sinatra's 1950 recording of Sweet Lorraine. Others appearing include Ella Fitzgerald, Mel Torme, Diana Krall and many others. The CD is available but I don't think the charity exists anymore. I went to their website and the domain name is for sale. So I don't know where the money goes if you buy the CD. And this is likely the only time George Benson and Jill Scott will record together. Here's George Benson and Jill Scott performing Summertime on the 2002 Bravo TV show Broadway's Best.